When the Penguins last saw Jean-Francois Berube, he was stopping 33 of 34 shots to lead the Islanders to a 2-1 win in Pittsburgh. But the curse of the unknown goaltender doesn't extend to the second start. The Pens lit up Berube, scoring 5 goals on 33 shots, Oskar Sundqvist had the first goal of his NHL career on a shorthanded breakaway, Patric Hornqvist scored his 20th of the season, and Matt Murray stopped all 24 Islander shots for his first career NHL shutout as the Penguins clinch a playoff berth with a 5-0 win. Also scoring for Pittsburgh were Matt Cullen, Phil Kessel, and Tom Kuhnhackl. After a start in which both teams would feel each other start, Matt Murray would face his first big test of the game when Frans Nielsen would come break free and come in all alone on a breakaway, but Murray was able to make the save. Unfortunately for Pittsburgh, Sidney Crosby would be called for slashing earlier in the play, and the Islanders would get the first power play of the game. 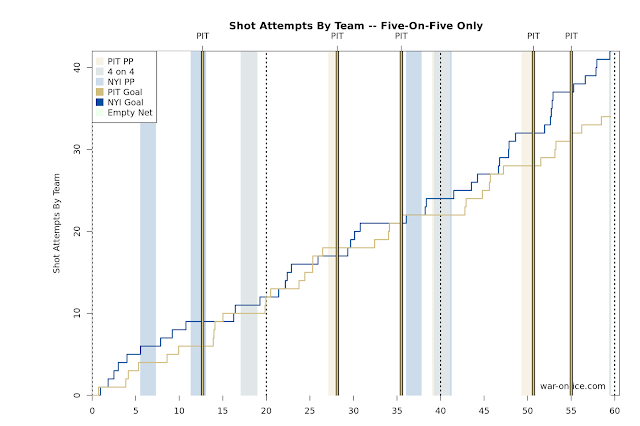 But the Pens penalty kill would do a decent job of keeping the Islanders from being able to set up, and they killed off the opportunity and returned to even strength. Midway through the period, Ian Cole would be called for interference on Casey Cizikas, and the Islanders would again get a man advantage. Kyle Okposo would ring a shot off the cross bar, but it was Oskar Sundqvist who would open the scoring shorthanded with his first career NHL goal. Jean-Francois Berube would send an errant pass up the center of the ice, and Sundqvist grabbed it at the blue line and wristed it past Berube to make it 1-0 Pittsburgh. Matt Martin would begin to up the dirty play after the Pittsburgh goal. Moments after the Pens killed off the penalty, Martin would shove Ian Cole in the back and into the Pens' net. It could've been a dangerous play, but Cole slid past Murray as he covered the puck. Later in the period, Martin boarded Justin Schultz in the Pittsburgh zone, but the refs would give Cole a very questionable penalty for roughing after he gave Martin a cross check after the play. The teams would play 4-on-4, and after exiting the penalty box Martin and Cole dropped the gloves, with Martin getting the better of the fight. The Pens would nearly get a goal in the waning seconds of the period, but after the puck sat loose in the crease the Isles were able to clear the puck away. The teams would enter the first intermission with the Penguins leading 1-0, and neither team would gain much of an advantage early in the 2nd period. 7 minutes in, Kris Letang and Nikolay Kulemin dropped the gloves after Kulemin slashed Letang's hand, but as neither player ended up throwing punches they would receive only roughing minors, but Kulemin would also get a slashing minor to put the Penguins on their first power play of the game. Justin Schultz would one-time a pass from Sidney Crosby from the top of the zone, and Patric Hornqvist would deflect it behind Berube for his 20th goal of the season, increasing the lead to 2-0. It was a milestone play for Crosby, as the assist gave him 600 for his career. The game would continue to be chippy throughout the 2nd period as the Islanders looked to cut into the Pittsburgh lead, but it would be the Penguins getting the next goal on the board. Matt Cullen drove the center lane with the puck on his stick, and he picked the near corner over Berube's blocker, giving the Pens a huge 3-0 lead with 4:30 left in the period. It wouldn't be smooth sailing into the intermission though, as Chris Kunitz cleared the puck over the glass from the Pittsburgh zone to earn the delay of game penalty. The Isles would go on the man advantage, and Carl Hagelin would nearly have a breakaway early in the kill, but Nick Leddy was able to match him stride for stride to keep a scoring chance from materializing. But the Penguins would do a good job of disrupting the Islanders, and after killing off the penalty they'd get a power play of their own with less than a minute remaining as Thomas Hickey was called for hooking Hornqvist in the neutral zone. However, the Pens would lose the advantage shortly after it started when Trevor Daley lost his footing and covered the puck at the New York blue line, earning a concealing the puck minor. The Penguins would take a commanding 3-0 lead into the 3rd period, and accompanying that would be a 36-0-0 record on the season when leading after two periods. There would be some concern as Kris Letang looked to injure his foot in a collision along the boards, but after initially missing time he would return to finish out the game. The Pens would just be looking to escape the 3rd period healthy, but after Marek Zidlicky was sent off for high sticking Letang Pittsburgh would further pad the lead on the ensuing power play. Phil Kessel pounced on a turnover in the neutral zone and snap a shot that beat Berube short side, essentially icing the game for the Penguins at 4-0. They'd tack on another goal later in the 3rd when Tom Kuhnhackl tapped in a loose puck in the crease into an empty net. The Penguins didn't overwhelm the Islanders at even strength like they've been doing to teams in recent weeks, but with 2 power plays goal and one while short handed helped Pittsburgh run away with the game in a laugher. They still managed to come out on the right side of the possession game, even if barely: they had a score-adjusted 50.3 CF% in what has been one of their lowest totals lately. With the win, the Penguins are assured of hanging on to 2nd place in the Metro regardless of what the Rangers do tonight against the Sabres, and the Pens will return home tomorrow to face the Philadelphia Flyers for the home finale.